Bosch has formed an alliance with Toom hardware stores in Germany to offer an electric van sharing service that could be expanded to other sectors. The service will launch in December 2018, offering access to StreetScooter vans for customers at five of Toom’s hardware stores; a subsidiary of the German retail group Rewe with more than 330 stores nationwide. The service will target last-minute needs, with drivers able to use an app to book a van, climb in, and transport bulky purchases home and then return the van to the same station. Users pay a flat hourly rate that includes mileage and battery recharging. Drivers at the selected stores – Berlin, Frankfurt, Leipzig, Troisdorf and Freiburg – will also be able to use charge spots at the stores. “Bosch is growing with digital services for urban mobility. 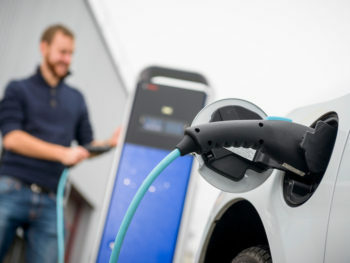 A service for sharing electric vans has huge potential for growth,” said Dr Rainer Kallenbach, president of the Connected Mobility Solutions division at Bosch. The business augments Bosch’s existing forays in the sharing services business – its Coup rental service launched in 2016 and now has a fleet of 3,500 scooters in Berlin, Paris and Madrid – and could be expanded outside the hardware store sector, for example furniture stores, supermarkets, or electronics stores.